5 Best Treat Dispensing Dog Toys – Slow Down Treat Feasting of Your Dog! It’s really tough to find a nice treat dispenser dog toy nowadays, especially due to a lot of worthless products flooding the market. But do not worry, here we are going to let you know about the Best Treat Dispensing Dog Toys that your dog just needs. The basic function for a treat dispenser dog toy is to keep the dog occupied for a long time and decrease the treat intake, get the excess energy out yet be super fun at the same time. So what is the problem with a lot dog treat toys then? The basic problem is that dogs are intelligent animals and you cannot puzzle them with the same thing every day because once they figure something out, they store it in their permanent memory! But unfortunately, most of the treat dispensing dog toys on the market do not understand this and provide products that can’t keep the dog occupied for even 5 minutes. But as we said, you do not need to worry about this, we have got you covered. Every product that you are going to see in this article is a quality product and satisfies the characteristics that we define for an ideal treat dispensing dog toy. Check out our top pick for treat dispenser dog toy below. Kong Wobbler is one of a kind product that is simple yet super effective. It wobbles around making it a little tricky for the dog to get the treats out. It is super fun and tough as well. With Kong quality materials, it is safe for all the dogs. 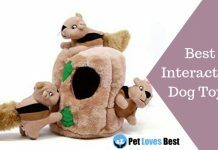 Being available in multiple sizes and colors, this is the best toy for dogs of all sizes and ages! Dog treat toys can be of various size and shapes. Most popular of them all is wobble and ball. These both are fun to play with and are a little tougher than the other shapes. So what is need for treat toys for dogs? Dogs love treats. They devour every single one of them as soon as you show them to your canine, right? Also, they are never satisfied. So no matter how many treats you feed them with, they will always urge for more. This is a trouble, especially due to the fact that a treat is for occasional feeding or appreciation. They are not the content food that you want your dog to feed on. As it turns out, you need to control the dog’s feeding or treats. But at the same time, they should not be urging for more. Hence, came the treat dispensing dog toys. These toys keep the dogs occupied while trying to take the treats out. They effectively limit the number of treats intaken by the dog and also make sure that some of the excess energy is wasted. Check out the review to the Best Dog Treat Dispenser Toys on the market. We’ve made sure to cover every essential details that you will need! Kong Wobbler is one of our most favorite products. This product comes in the shape of a wobbler. It is a favorite toy for a lot of pet parents as it is pretty tough to get the treats out and keeps the dog occupied a little longer than other shapes. This one is one of the best treat dispenser dog toys on the market made by one of the finest dog toy manufacturer Kong. Types of Supported Treats: Cubes or Balls. 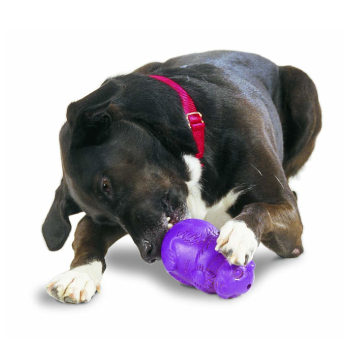 What We Liked: One of the best wobble shaped treat dispensing dog toys. They have done a few modifications in the shape of the toy since the launch of the initial toy. It is available in multiple sizes making sure that you find the ideal size for your dog. Also, all this toy is easy to fill with its twist and fill functionality. You can put multiple types of dog treats in this product. But keep in mind that treats that are too small will be easy for a dog to bring out. All Kong treat dispenser dog toys are made in the USA. They are fun to play with and keeps the dog occupied every single day. What else do you need?! It is super fun and engaging. Keeps the dog busy for a long time. The balance of the wobble is decent. This one is one of the most appreciated treat dispensing dog toys due to its unique shape and functionality. Also, West Paw is a great brand having proprietary blend of BPA-free plastic that does not hurt your dog. This food dispensing dog toy comes with a shape of a roller. It has a slit on the sides. This slit allows you to put multiple types of treats inside. Also, this unique shape increases the life of your expensive dog treats. What We Liked: One of the few treat dispensing dog toys that can keep both sticks and balls types of treats. 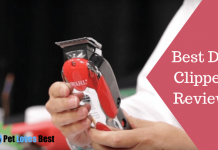 This product stands apart from their competitors due to the shape. Being able to put in treats in the shape of a stick is really a decent feature that lacks in products like Kong Wobble. The price of the product is well justified as well as the quality of the product is very good. 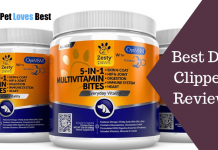 It comes in multiple eye-candy colors that all the dogs love as soon as you put these treats in front of them. Though this treat dispensing toy can keep any size and shape of treats inside. Due to the slit, ball-shaped treats are really easy for dogs to pull out. However, it is tricky to pull out sticks and which is why we love this product so much. 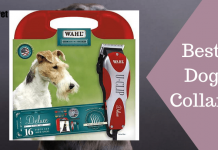 This product is tough, beautiful, and dogs love them. They keep them occupied for quite a while and that is why investing in this product is a really safe bet. Also, these are guaranteed tough against any damage caused by the dog. The product is made from super tough materials and is guaranteed against dog damage. The most important thing, which is the material, is made from BPA-free material. So there is no chance of your dog getting hurt. The colors are really attractive, which is the specialty of West Paw. The rolling shape with a slit allows you to put multiple types of treats inside this toy. 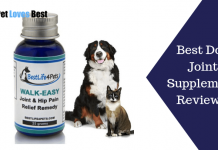 It effectively keeps dog busy for a while and also increases the life of the costly treats. Smaller ball-shaped treats may escape easily. Dogs love to play with a ball. I have never seen them getting tired of it. And what if this ball came with treats inside them?! Bazinga, right?! This Our Pets food dispensing dog toy comes in the shape of a ball that pours out treats as the dogs roll and toss them around. Also, it has an oval shape that allows you to put multiple types of treats inside. What We Liked: One of the best double secure dispensing functionality treat dispensing dog toys. This dog treat ball comes with a unique function. It has a two-way pouring system. First, the treat has to come out of the inner part of the ball and further it can come out from the dispensing hole. This allows the toy to make the dog spend more time with the toy and also helps to get their excess energy out. 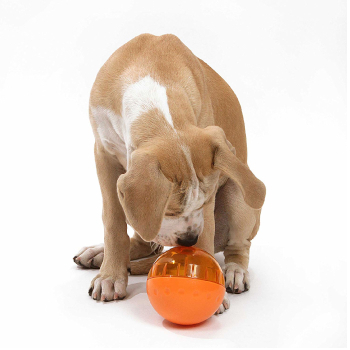 This dog treat ball is easy to clean, functions perfectly and dogs love to roll them around. Perhaps, this is the best dog ball ever invented! The ball shape is fun for a dog to both play and get the treats out. The oval shape allows to put multiple types of treats. The double secure dispensing functionality keeps the dog busy. It is not that tough to withstand chewing from an aggressive dog. StarMark Bob-A-Lot is a treat dispensing wobbler. It comes with two separate holes to dispense treats. It is a direct competitor to the Kong Wobbler and hence some advancements as well as drawbacks compared to the Kong. 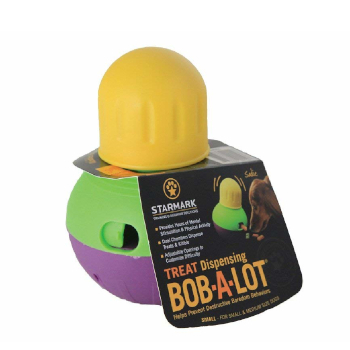 StarMark Bob-A-Lot comes with adjustable dispensing holes so that you can adjust the difficulty for your dog to get the treat out. Also, it is of a bigger size so you can add multiple types of treats inside. 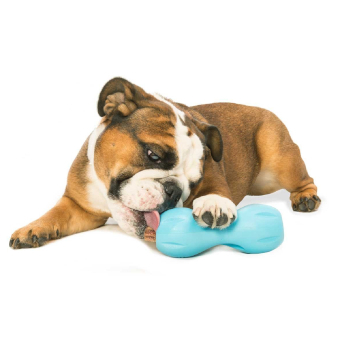 What We Liked: One of the toughest treat dispensing dog toys. A drawback of this treat dispenser dog toys is that it comes with an opening that is pretty tough to fill with treats. So sometimes it may get a little bothering to fill the treats piece by piece in the treat dispensing dog toy. However, this treat dispensing to is fun to play with and is made with tough materials. It will probably last you more than the Kong Wobbler. Also, the effective weight at the bottom makes it a little tougher for the dog to get the treat out. With adjustable openings and added weight, this is one of the toughest treat dispensing dog toys on the market and is not a bad choice at all. It is big enough to carry sticks. The dispensing hole is adjustable. Comes with an anti-slip bottom. This is one of the few wobbler treat dispensing dog toys that are weighted for better wobbling. Tough to fill and clean. Petsafe products are always fun and full of life. These treat dispensing dog toys come in the shape of a squirrel. 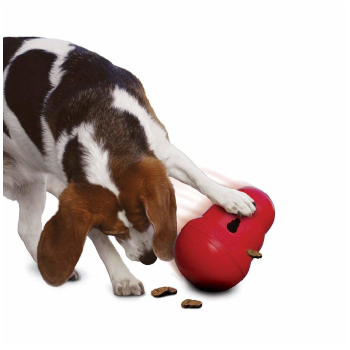 These dog treat toys stand out in the market due to their universal functionality of having different kinds of treats. Due to the universal opening, you can out both the treats and different kinds of things like peanut butter inside these treat dispensing dog toys. 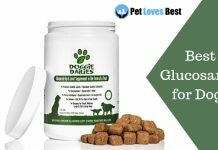 If you are looking for something that is super tough to get the treats out from, well, this may not be the one for you. This is an easy going dog treat toy that will get the treats out at a smooth pace without bothering the doggo. Also, its fine built eases the dog and makes him devour the treats in quite with this one. These treat dispensing dog toys are super fun and allow for multiple kinds of treats. They are durable and made from quality materials. Also, they effectively slow down the meal time of the dog. Hence, these treat dispensing dog toys would be the best choice for pet parents who want to feed their dog with different kinds of treats. These treat dispensing dog toys can have most types of treats. Treat dispensing dog toys that effectively reduce the meal time. Built in attractive colors and fun shapes like squirrel. Easy to get the treats out. So that’s it! These were the best treat dispensing dog toys on the market. All of them have different functionalities so choose wisely, however, each one of them is a great choice. If you have any query regarding the products, let us know in the comments. We will make sure to answer you back shortly.